Located in the eastern part of India with the Himalayan Ranges at its North and the Sunder bans at its Southern end, West Bengal is touched by all hues of Mother Nature. It is also a state that has produced the fiercest freedom fighters, the best academicians, the most celebrated poets and writers, well-known social reformers, and extremely talented singers and dancers. The state is not just known for producing some of India's greatest minds; it was also home to St. Mother Teresa, the tireless missionary of Kolkata. Bengal has a rich history and has seen many changes in its political scene through the ages. From being ruled by the great Vedic kings of Maurya and Gupta dynasties two millenniums ago, it has seen the rule of Pala and Sena Dynasties, Turko-Afghan Sultans and other Hindu kings through the middle ages. In the early 18th Century, after the fierce and decisive Battle of Plassey, the reigns of the state passed onto the British Empire, who made the current state capital Kolkata (Calcutta), the capital of the British Empire in India. The long association with the British left an indelible impression on the state's culture and education system and brought about enormous social change. The state of West Bengal was created with the partition of Bengal in 1947 along religious (Hindu-Muslim) lines whereby East Bengal (present day Bangladesh) went to the newly created Pakistan and West Bengal remained with the Independent India. A state blessed with diverse topography, fertile soil, huge diversity of flora and fauna, varied and rare wildlife including the Royal Bengal Tiger, West Bengal's geographical location naturally lends itself to a largely agrarian economy. Apart from agriculture, tea-plantation and processing, other agro-based industries, small and cottage industries, cotton textile mills, jute mills, steel and alloy plants are prominent on the state economic scene. The undivided or pre-Independence Bengal was a huge state that included parts of today's neighboring states like Assam, Tripura, Odisha, Bihar, and Jharkhand and of course today's Bangladesh. 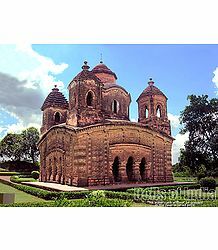 The culture, cuisine and lifestyle of people in Bengal is influenced by its nearness to the Bay of Bengal, its various rivers including the holy Ganges, the abundance of fertile lands, its varied topography, the impact of ruling dynasties and the British Empire, not to mention the post-Independence development and intermingling of people from different backgrounds. Bengali is the official language of the state, though Hindi and English are also spoken as second languages by many, especially in towns and cities which are more cosmopolitan in nature than villages. The literacy rate in the state has improved considerably in the past two decades due to the efforts made by various central and state government schemes with primary education being made free in the rural areas. This has had an obvious impact on lifestyle, attire, hygiene, occupation, and other aspects of their daily life. Preparing food is a labor of love for Bengalis. Though their staple is rice and fish, the locals have perfected the preparation of each variety of fish into an art form with the use of mustard oil for cooking and the distinct flavoring achieved with the choicest of spices. Bengali sweet dishes like Sandesh and Rasgulla are also popular across the country. Most of the rural and tribal population is engaged in agricultural activities, while working in industries is the second most popular occupation. Migrants from other states like Assam, Rajasthan, Bihar, etc. are settled all over Bengal and engaged in trading activities or working as industrial labor in the state's many factories. Apart from that, Bengal is also home to talented artisans and craftsmen who produce beautiful handicrafts that are popular all over the country and are even exported to other countries. 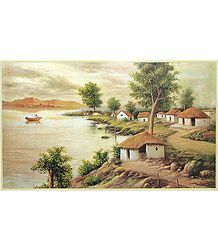 A major part of the rural population (almost 10% of the state's population) of Bengal consists of small and large tribal groups like Oraon, Bhutia, Garo, Munda, Lohara, Paharia, Kora, Santhal, etc. These tribes have their distinct language, customs, attire and history. While these tribal people follow their own ancient rituals, traditions and festivals, most of them have also adopted the mainstream Hindu culture, traditions and religious festivals that are characteristic of the rest of Bengal. Durga Puja, the most important festival of the state is celebrated by people from all backgrounds and religions with equal fervor. While farming is the main occupation among the tribal population, many among them are engaged in hunting and fishing, carpentry and weaving. They are also proficient in artistic work done on pottery, cloth, wood, cane and metals like copper and brass and as such, earn their livelihood by creating and selling handicrafts. The Baul singers, distinctly identifiable with their long saffron robes and matching turbans, have their origin in undivided Bengal when the society was firmly divided as per religious affiliations of its people. Bauls, mostly consisting of Vaishnav Hindus and Sufi Muslims, are a group of singers who renounce their families and roam from one place to another to spread the message of peace and the oneness of soul with the divine. Bauls have contributed immensely to the state's music scene and have served as an inspiration to the likes of Rabindranath Tagore, the celebrated Bengali poet. The mystic sect uses the bamboo flute and ektara, the one stringed musical instrument to accompany their songs. They are also credited with inventing instruments like dotara, premjuri, etc. There are many Bengali folk dances depicting mythological wars or those associated with war times reflecting the effect of constant wars and struggles of people in the evolution of the state's culture. Some of the prominent ones among them are Purulia Chhau, Stick dance or Laghur Nritya, Ranapa Dance, Dhali and Paika Nritya, Kukri Nritya, Raibense dance, etc. Religious Songs and Dances: West Bengal, with its many religions and sects, has a rich repertoire of religious folk songs and dance forms. 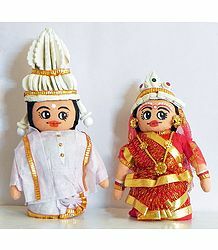 These include Gajan (song and dance form) which is performed to praise Lord Shiva and his consort Parvati, the Natua dance which is again related to Shiv Puranas and requires acrobatic skills and proficiency in tricks with fire, the Kirtan dance which unites people from all social and religious backgrounds, Ganga dance devoted to the Holy Ganges, Jhumur dance, etc. West Bengal being a primarily agrarian society, it is natural that events and seasons related to sowing of seeds, rains and harvest are celebrated with a lot of ardor by village folks, especially the farming communities. Some of the important ones that relate to farming include Gambhira dance of Malda district which is also associated with mythology, the Chaibari (Tea Garden) Nritya, Mech dance, Tushu songs that are the most popular harvest songs, Nabanna dance, Noila Broto, etc. Some Popular Tribal Dances: These include Santhali dance, Rabha dance, Mundari dance, Rajbanshi dance (devoted to Teesta river) etc. 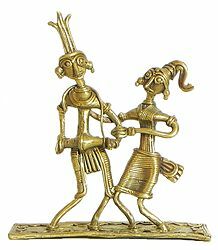 These dances are performed to the accompaniment of a number of musical instruments and are quite elaborate in nature. The people of West Bengal have tremendous respect for all kinds of art forms and most members of a household are engaged in learning and practicing it in some form or other. The state has a rich cultural heritage and people go out of their way to ensure that the traditional art forms are passed on from generati on to generation. The state has produced some great minds and thinkers like Rabindranath Tagore - the world renowned poet, writer, and painter who contributed immensely to the art and music scene of the state and indeed, the whole country. Pottery is an art form that is prevalent all over Bengal and makes use of the abundant river side clay from its various rivers for producing beautiful statues, pots and pans, storage jars and even toys and colorful dolls. This art is practiced mostly by the women of the state, especially in rural areas. 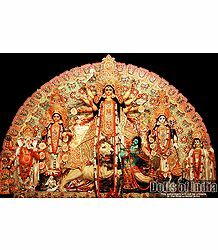 During Durga Puja, the biggest festival of the state, grand idols of the Goddess Durga are produced by potters that then adorn the Puja Pandals throughout the state. Terracotta sculpting is very popular and is one of the primary forms of income in the city of Krishnanagar and Terracotta artisans often win various national and international art awards. Dhokra Kamar Tribe of the state practice this metal casting technique, also known as hollow casting that uses lost wax to produce divine figurines, jewelry, lamps, etc. 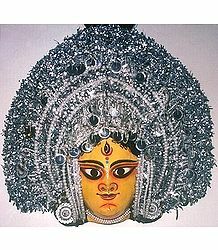 This is one of the most famous folk-art forms in West Bengal. 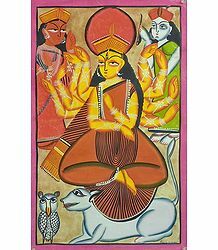 Artists typically use water color to depict life in Bengal or Hindu Gods and Goddesses in a style typical to them. 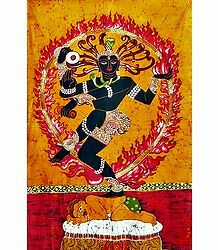 The artists originally belonged to the Kalighat provice of Kolkata, hence the name. 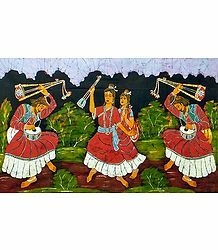 Batik paintings are very popular in West Bengal and artists produce some striking paintings depicting village life and Hindu Gods. Artists now create colorful Batik paintings not only as paintings but also as motifs on Sarees, Kurtas and other apparel. Muslin, also known as mul mul is a fine cotton cloth which is being produced in the state since 17th century and was at one time Bengal's biggest export item, next only to Darjeeling Tea. 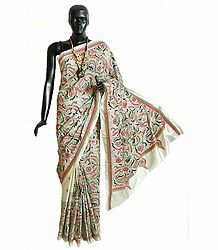 The cool cloth is used mostly as dress material for both ethnic and western apparels. This is a traditional embroidery form of Bengal which is done both on cotton and silk materials and involves mainly floral, birds and animal motifs. 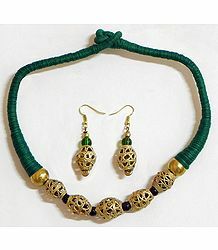 It is used mainly on Dhotis and Sarees which form the traditional male and female attire of the locals. 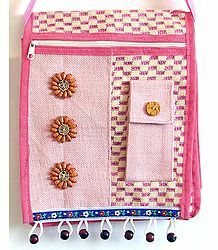 Apart from these, Kantha motifs are also used on blankets, bedspreads, table cloths, etc. 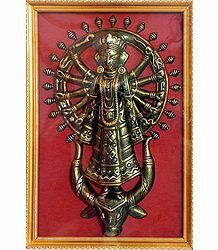 Bengal artisans use wood, especially sandalwood, for carving traditional designs depicting deities. These pieces are used as decorative panels. Jute items from Bengal range from carpets, decorative pieces, jewelry, bags and even bedspreads in a variety of colors and designs. At craft fairs across the country, jute products from Bengal have always been one of the most appreciated and well-received items. Some of the other popular crafts of the state are stone carvings, bone and ivory carvings, wooden and papier mache masks, bamboo and cane baskets, woolen carpets and Thangka paintings from Darjeeling, cane mats from Cooch Bihar, terracotta pottery and shitalpati mats from Dinajpur, etc. Durga Puja is by far the most important festival of the state so much so that Bengalis living outside of the travel especially to their native place to celebrate the festival. West Bengal is transformed into a lively and colorful place with much gaiety in the spirit of the locals who indulge in singing, dancing, and partying during the weeklong festival. It usually falls in the month of October. Schools are closed during the days and markets overcrowded as people shop for new clothes during the day and visit the innumerable Puja Pandals (temporary decorated and lit up tents) with their grand Goddess Durga idols during the evenings. The whole atmosphere of the state during these days is electric and an experience worth having. This is one of the largest fairs held in India, indeed in the world, considering the number of people visiting the venue - Sagardwip, an island at the mouth of the river Hugli where it meets the sea. Celebrated on the Makar Sakranti day in January every year, the fair is considered a pilgrimage by Hindus who bathe in the holy waters of the river Hugli, a distributary of the Holy Ganges. Bengali New Year or Naba Barsha is celebrated around 14th or 15th of April on the first day of the Bengali Calendar. The day is marked by exchange of wishes, greetings and sweets and visits to temple by the locals. West Bengal has a significant Muslim population and Eid-ul-Fitr is celebrated after the holy month of Ramzan followed by Eid-ul-Juha a couple of months later. Festivities include visits to mosques, preparation of special Eid delicacies, and exchange of greetings. 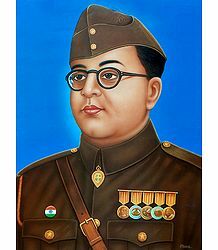 Netaji has been one of the most venerated freedom fighters and his birth anniversary on 23rd January is celebrated across the state with young boys and girls parading in military uniform to pay a tribute to his Indian National Army. The birth anniversary of Sri Ramakrishna Paramhansa, the well known mystic and religious leader who inspired his disciple Swami Vivekananda to found the Ramakrishna Mission, is celebrated in early March. The festival held at the Mission headquarters attracts lakhs of devotees every year. 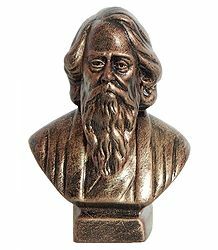 Rabindranath Tagore's name is synonymous with art and culture and his birth anniversary on 7th May is marked by cultural activities like, singing, dancing, drama, as well as seminars and talks on his life and times. 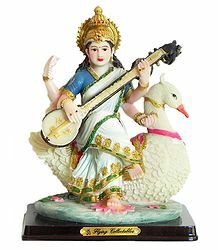 Saraswati (the Goddess of Learning) Puja is celebrated on Basant Panchami Day, usually in the month of January/February. The day sees students and artists worshipping the Goddess with prayers and flowers clad in traditional attire. 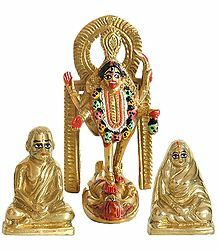 Small kids are initiated into the learning phase of their lives by getting them to touch pen, ink and paper for the first time while students and artists keep their books and instruments at the feet of the idol to receive her blessings. Mahesh Rath Yatra or chariot festival has been celebrated for centuries with much fanfare in the states of Odisha and West Bengal. The festival involves taking out a procession of chariots carrying Lord Jagannath with devotees pulling the ropes of the chariot. The state has a sizeable Christian population and given the modern Indian outlook of celebrating every festival as its own, Christmas is celebrated with a lot of good cheer and zeal by people from all walks of life. Market places are decorated with Christmas trees and lights. Gifts are exchanged and tradition Christmas fare prepared in Christian households. The hill cities of Kalimpong and Darjeeling are mostly inhabited by followers of Buddha and the birth anniversary of Lord Buddha is celebrated by their disciples in the month of May by reciting scriptures, offering prayers, indulging in group meditation and visiting monasteries. Apart from the above, there are many local festivals like Vishnupur festival, Jhapan, Joydev Mela, etc. are also celebrated colorfully in towns and cities associated with these festivals. Ashirbaad (Blessing): This is the formal engagement ceremony and involves a meeting of the two families along with an exchange of gifts. The elders of the family bless the would-be couple and sweets are served. Vridhi Puja (Ancestor Prayer): It involves offering of prayers to ancestors and is held a couple of days prior to the wedding. Aai Budo Bhaat (Wedding Eve Dinner): This ritual is akin to the bride's last supper in her home before she takes the wedding vows the next morning. As such, it is organized at a very grand scale. Dodhi Mongol: This ritual requires a few married women to visit the river Ganga, or any other nearby river or pond along with the groom and fetch water from it in a pitcher after inviting the Goddess Ganga to the wedding. This water is used to bathe the bride and the groom. Gaye Holud (Turmeric Ceremony): This takes place for both the bride and the groom at their respective homes and involves applying turmeric paste on their faces. This is of special significance for the bride as the turmeric is said to give a glow to her face. Groom's family visits the bride's family with gifts and a raw, decorated fish. Welcoming the Groom: Both the bride and the groom take bath and get dressed in their wedding finery once the early morning rituals are over. The Bor Jatri (groom and his relatives and friends) then proceed to the wedding venue where they are welcomed in a traditional way, using Baran Dala, by bride's mother with conch shells blowing in the background. The groom is then led to the wedding Mandap (a decorated canopy), seated and gifted new clothes. The Ceremony: The bride has to cover her eyes with betel leaves till she is carried by her brothers around the groom seven times. After this, she is allowed to look at the groom and they exchange garlands thrice. This is followed by the giving away ceremony or sampradan whereby the father places the bride's hands in the groom's amid a chant of mantras and with the holy fire as the witness to the wedding ceremony. The bride and the groom make seven circles round the fire to signify their union for seven births. The ceremony is complete with the groom putting sindoor on his bride's hair part. Bidaai: This is an emotional event with the bride bidding farewell to her family before leaving for the groom's house. Rituals at the Groom's House: The bride dips her feet in aalta or red dye before stepping into the groom's house. The newly-weds spend the first night in separate rooms. The next day, the bride prepares food, usually a sweet, for the family. Later in the day, the couple visits their wedding site to pray to the Sun God. At night, the couple spends their first night together on a bed decorated with flowers. The traditional Bengali groom costume consists of a silken Dhoti-Kurta ensemble over which a silk cloth is draped during the wedding ceremony. The groom also wears the traditional head gear known as Topor which is a beautifully made paper hat. The bride usually wears a Benarsi silk sari with a white base and a border in red, maroon or pink hues. Of course, with time there have been changes in the attire and gold and zari work saris in various shades of red are preferred by many brides. The bride applies tika on her forehead to symbolize the Goddess lakshmi and alta on her hands and feet for prosperity. Traditional gold ornaments including hathphools (worn on hands and fingers), kaanpasha (elaborate earrings), nath (nose piece), hansuli, chik, panchnari (traditional necklaces), etc. are a must to complete the bridal look. Like brides everywhere, a traditional Bengali bride aims to look her best on her wedding day. The various facets of the state of West Bengal can never be described in words. One must experience it oneself to understand the passion that its people bring to life. Be it education, sports, culture, cinema, family life or religion, the state has always enriched the culture of the country as a whole.